Several perennial ferns are native in our part of Virginia, and grow wild in the woods and ravines, unbothered by our herd of deer. Many of us have these ferns already growing in parts of our yards. They grow happily along year after year with exactly no effort needed by the gardener. If they are close to our homes, we might think to remove faded fronds in spring to spruce them up a bit. These welcome natives can be used intentionally in our landscapes to great advantage. 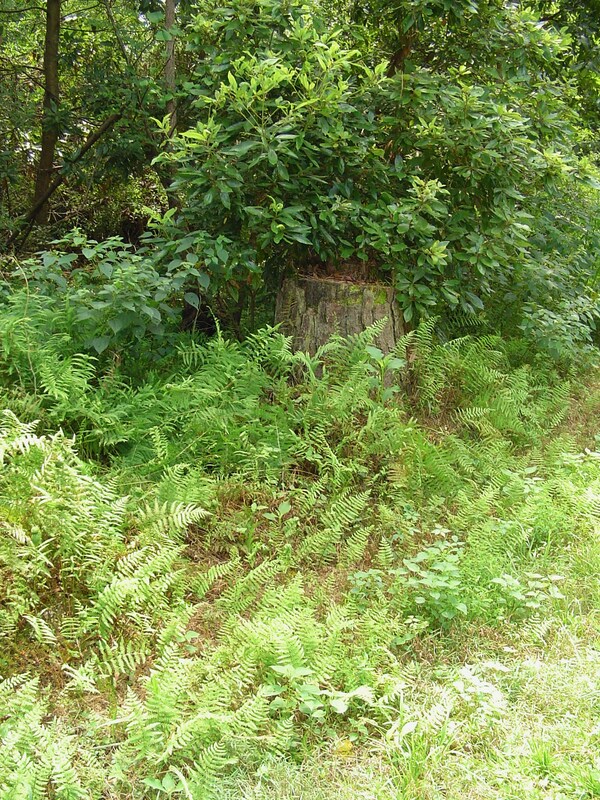 Naturalized ferns beside the road on Jamestown Island. Ferns are one of the most primitive of all plants. They first appeared in the fossil record about 360 million years ago, long before any seed bearing plants like grasses, trees, or flowers appeared. They produce no flowers or seeds. Ferns reproduce through the spores which develop on the back of their fronds, and by spreading on underground stems called rhizomes. Some ferns grow in clumps, others send up individual fronds from this underground stem. 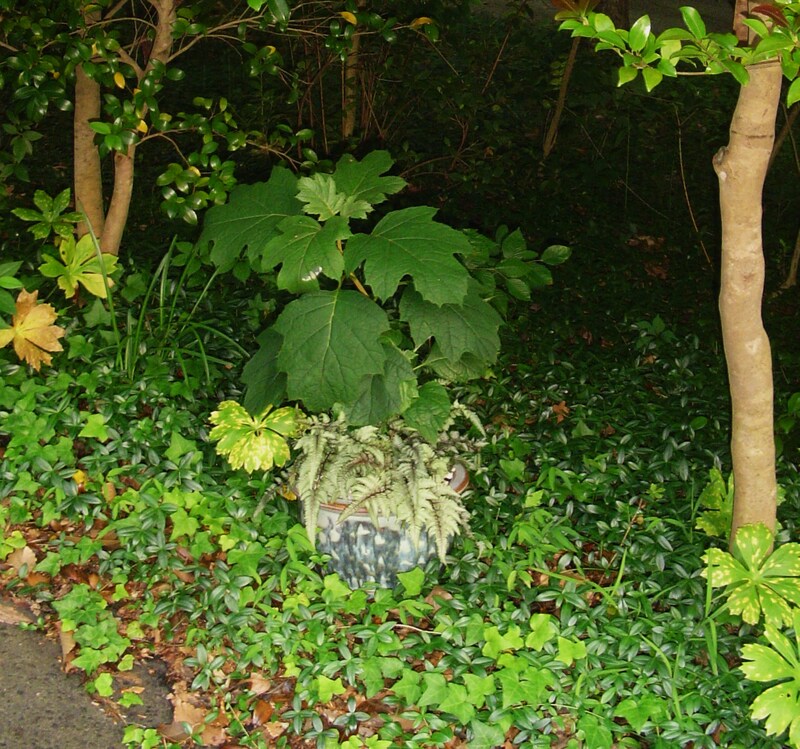 Some species tend to spread, making them excellent ground cover in shady areas. Others don’t spread quickly at all, but form handsome accent plants. Ferns can be found in a variety of sizes from very low growing to very tall. The first trees on Earth were actually tree ferns, which can grow to over 100’ tall. Although we normally think of tree ferns as tropical plants, varieties are available which can grow in our zone 7b provided they are given partial shade and moist soil. The majority of ferns native to our region range from 1’-4’ tall. Ostrich ferns will grow to 5’-6’ tall once established in moist soil. Ferns are tough plants. Most prefer shade, although some varieties will grow in full sun if given moist soil. Moisture and humidity, which we have in abundance most years, are the keys to success with ferns. Ferns don’t expect fertilizer, pruning, fencing, trellising, or coddling. Plant them, enjoy them, and leave them alone. 1. Is this fern hardy in zone 7b? If the answer is yes, you have a perennial which will return reliably year after year. If the fern needs warmer winter temperatures, grow it in a pot and bring it in each winter. Japanese Painted Fern with a Begonia Rex. This deciduous fern will die back in November whether kept indoors or out, but will return in April. 2. Is this fern evergreen or deciduous? Reliably evergreen ferns in our region are the Christmas Fern, Tassel Fern, and the Autumn Brilliance Fern. These plants might look a little tired and worn by spring, but they will stand in the garden or in outdoor pots all winter long. Deciduous ferns will survive the winter, but like other perennials, will disintegrate above ground after a hard freeze or two. The Japanese Painted Fern needs a winter rest, even when potted and brought inside. Once the days get longer in spring, and warmth returns, the fern sprouts new fronds and goes back into active growth. 3. How big will this fern get? Pay attention to the height and width potential of the fern. Although purchased in a tiny pot, you may be bringing home a plant which will grow quite large over the years. Put the right fern in the right spot, and make sure there is room for the fern to grow without crowding out something nearby. Most ferns grow quickly. 4. How much light will this fern tolerate? Normally we think of ferns for shady spots. They are excellent under trees and shrubs partly because they have fairly shallow roots. Some ferns will just shrivel into a crispy brown mess in too much sun, and others will thrive. Do your research ahead of time if you want to grow ferns in partial or full sun. The Autumn Brilliance fern is particularly tolerant of sun. Some lady ferns and Christmas ferns will also tolerate partial sun. Ferns are good problem solving plants in a forest landscape. 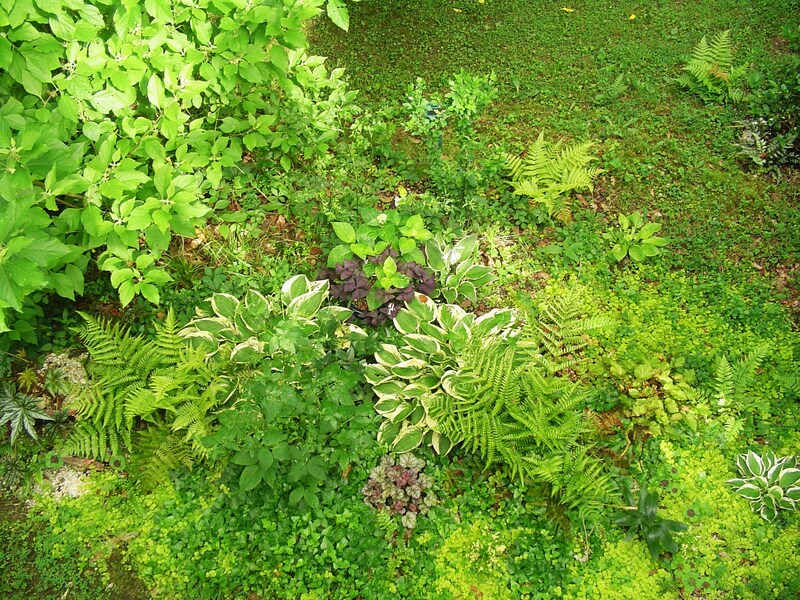 Many ferns will form a lush, dense groundcover in just a few years. They halt erosion and cover bare ground very economically. Ferns are a good choice to grow on a steep bank. Because they are good groundcover plants, and require little or no maintenance, once planted, they will work for you indefinitely. Ferns are good around the edges of things, especially to cover the knees of shrubs. 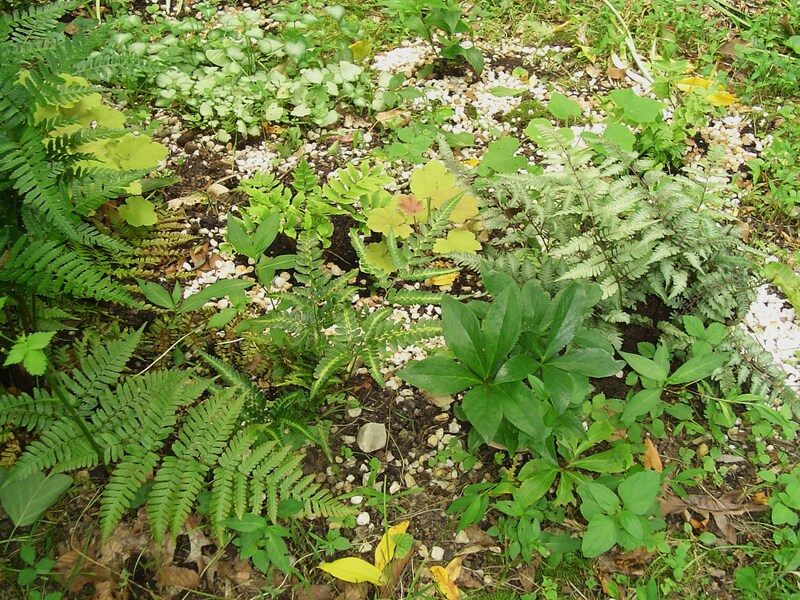 Ferns will grow well in areas with too much shade for flowers and other ground covers. They come in a variety of textures and colors. They work well mixed with Hostas, Heucheras, Vinca, Caladiums, Impatiens, Violas, Lenten Roses, and grasses. 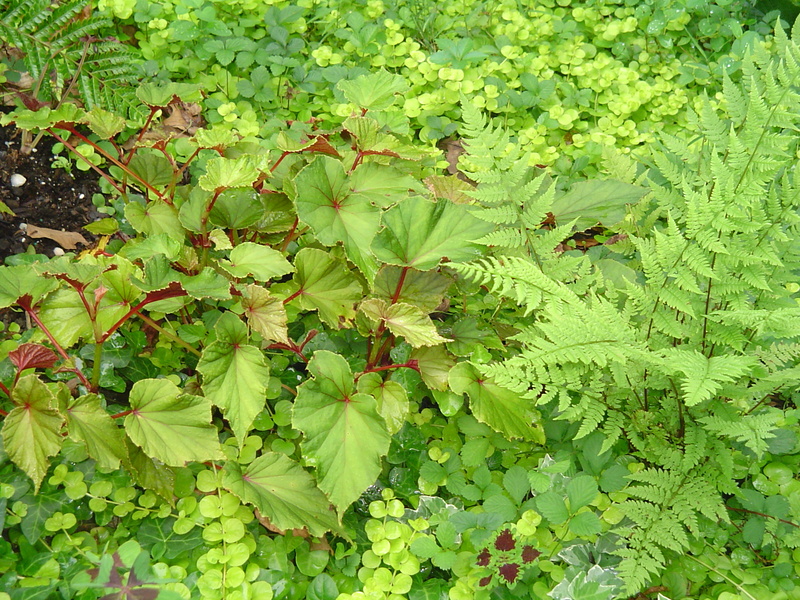 Plant ivy, moss, or Creeping Jenny as a ground cover around specimen ferns. Ferns aren’t bothered by deer, squirrels, or rabbits. I have had newly planted ferns disappear down a vole hole, but that is a rare occurrence. Once the fern begins sending out its roots into the surrounding soil it is rarely disturbed by small mammals. It can offer some protection to tasty plants nearby. Tall ferns, like Ostrich fern, can be used to form a fence, barrier, or a backdrop for other plantings. These ferns will not only reach 5’ tall or more, they spread by rhizomes and will make a dense planting over a year or so. Ferns love wet soil. Areas where water drains and collects are perfect for ferns. They won’t mind having wet feet, and will help dry the area by soaking the water up and releasing it from their leaves. 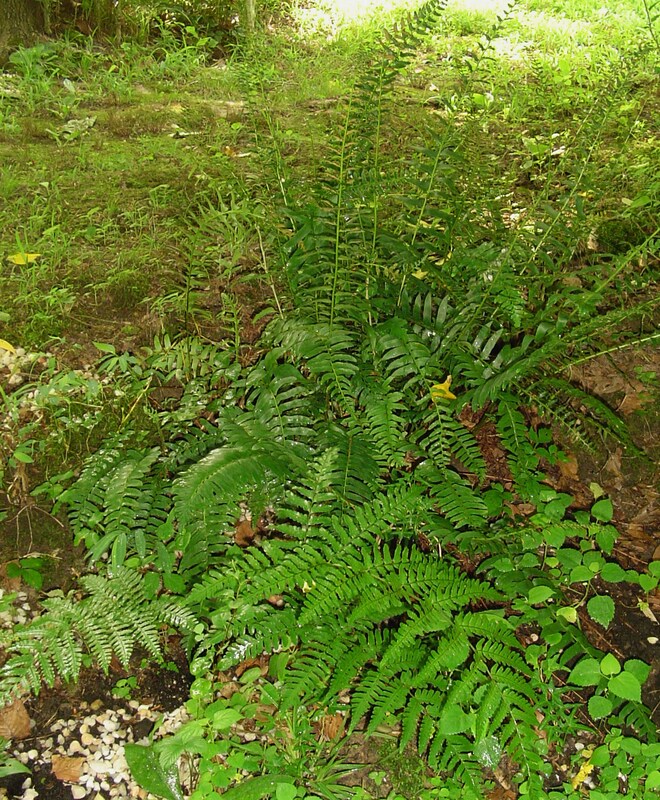 Interesting ferns are easy to purchase locally, and can be found economically online. 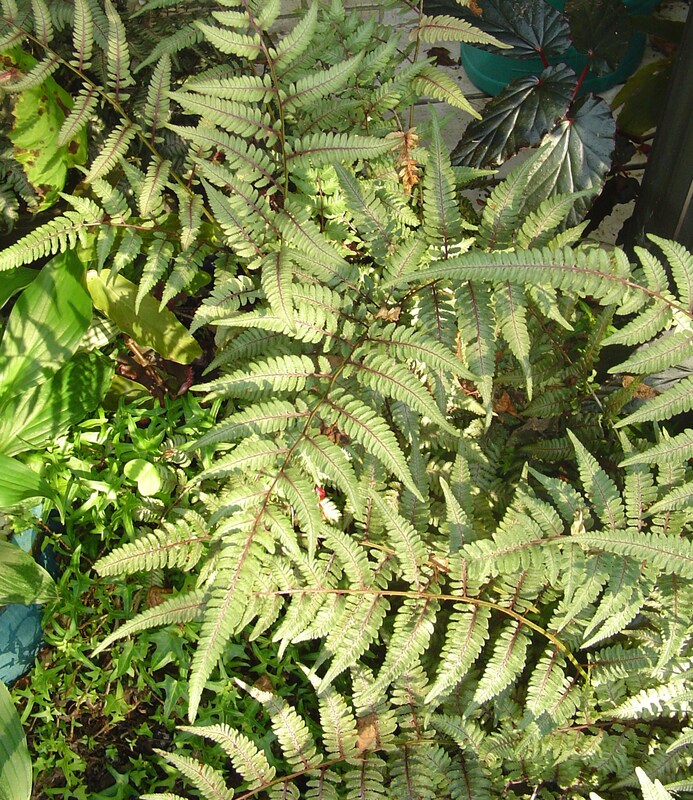 Ferns can be purchased at the big box hardware stores and at Homestead Garden Center in a variety of sizes. Homestead carried six or eight varieties this spring, in 2” pots, for only $2.50 each. They also offered ferns in 4”, 6”, and gallon pots. MacDonald Garden Center’s satellite stores in Williamsburg carried a very limited selection of ferns, but they did have them from time to time. When purchasing ferns in the houseplant section at big box stores, be cautious about planting the fern outside. These are often tropical plants which won’t make it through our winter. Rather, purchase ferns out in the garden department for landscape use. If purchasing ferns online, be cautious of the “bare root” ferns offered in many catalogs. These are unreliable, and I’ve wasted lots of money over the years buying these plants which never grew. Understand that they are dormant when they arrive. That means you get a mass of dry brown roots in a plastic bag. If you give in to the magazine photos in the middle of winter, at least pot the ferns up, when they come, and keep a close eye on them until they show strong growth. 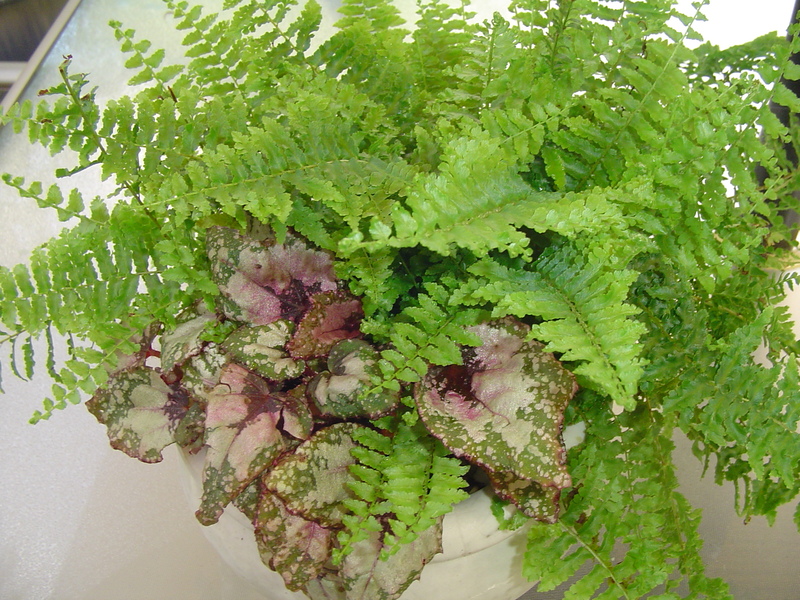 Better to search out “potted ferns” from online vendors which arrive alive and green in a tiny pot of soil. Ferns grow well where it is moist and partially shady, along with Heucheras, Lenten Rose, and other shade loving ground covers. 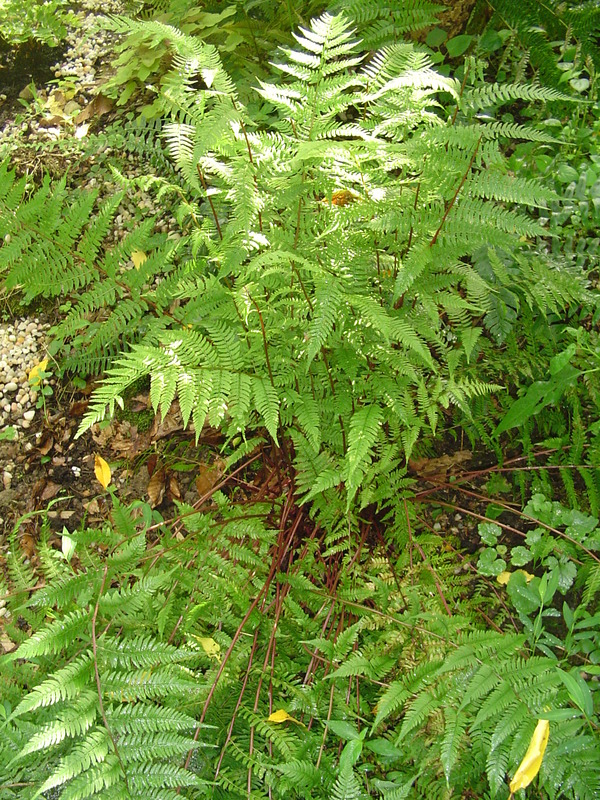 Planting new ferns is most successful in early spring or late fall. If you must plant between May and August, choose a stretch of cloudy wet days to give the ferns a chance to adjust to life in your garden. Once you have chosen a moist, shady spot in your yard for your ferns, dig a hole slightly wider than the fern’s root ball. 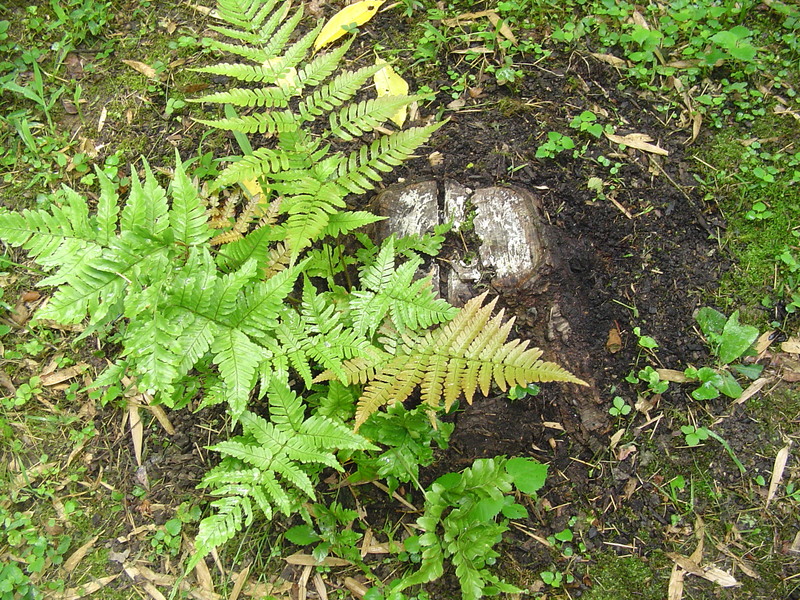 Dig a hole of the same depth, or slightly shallower, than the fern’s pot. Gently remove the fern from its pot, loosen the roots a little, and settle the root ball into its new hole. If you spread the roots out a little so you have a wider, but shallower mass of roots, you can encourage the fern to begin spreading horizontally. 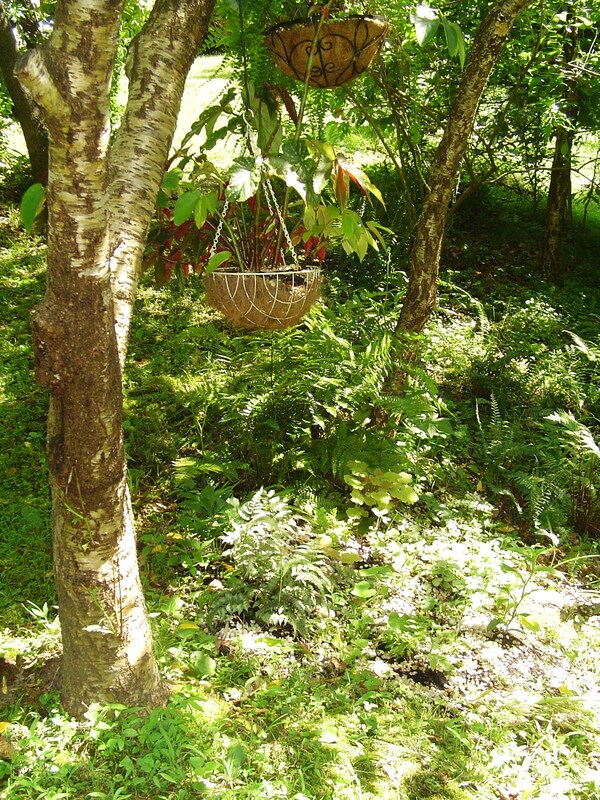 If you need to plant a little high because of tree or shrub roots already in the ground, use finished compost to make a little mound around the fern’s root ball to they are completely covered. 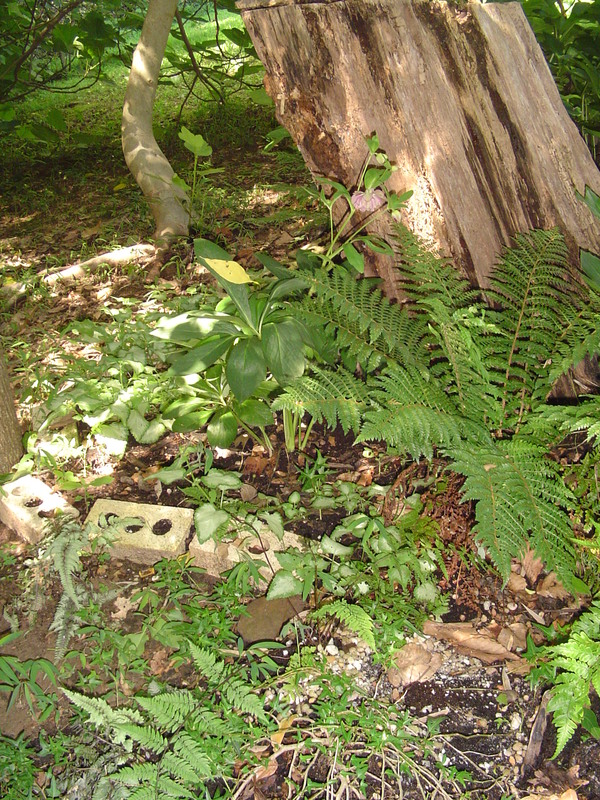 Use compost to mulch around newly planted ferns to hold in moisture, enrich the soil, and shade the roots. Water them in with plain water or a dilute solution of Neptune’s Harvest fish emulsion fertilizer, and make sure the plants have adequate moisture, especially in hot weather, through their entire first season of growth. 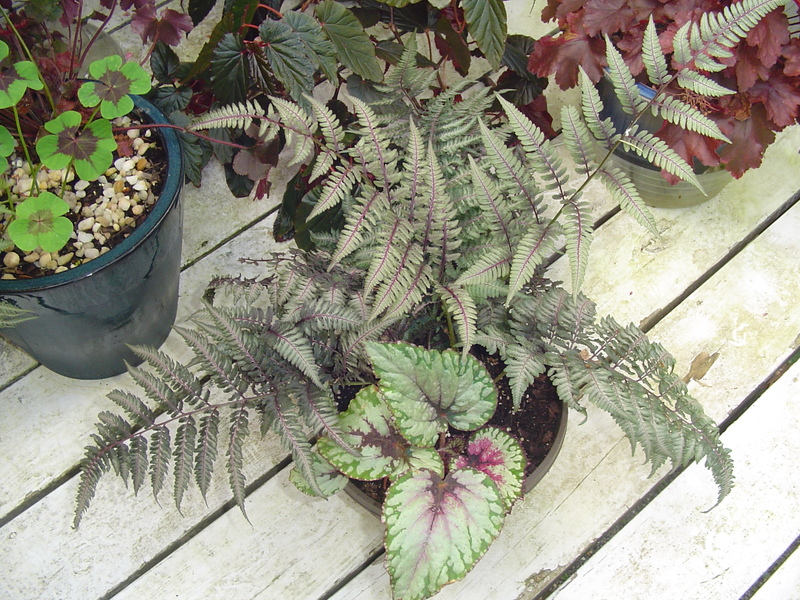 Ferns grow in this shaded area with a hardy Begonia. Autumn Brilliance Fern Dryopteris erythrosora forms large clumps of broad fronds. This evergreen fern is a yellow green, but new fronds are bronze. It can tolerate a wide range of light from almost full sun to deep shade, and is tough enough to tolerate drier soil. The plants will eventually grow to 2’-3’ high. Japanese Painted Fern, Athyrium niponicum- pictum is a highly ornamental deciduous fern. All of the Athyrium ferns are ornamental and include Ghost Fern, Lady in Red Fern, Branford Beauty fern, and others. 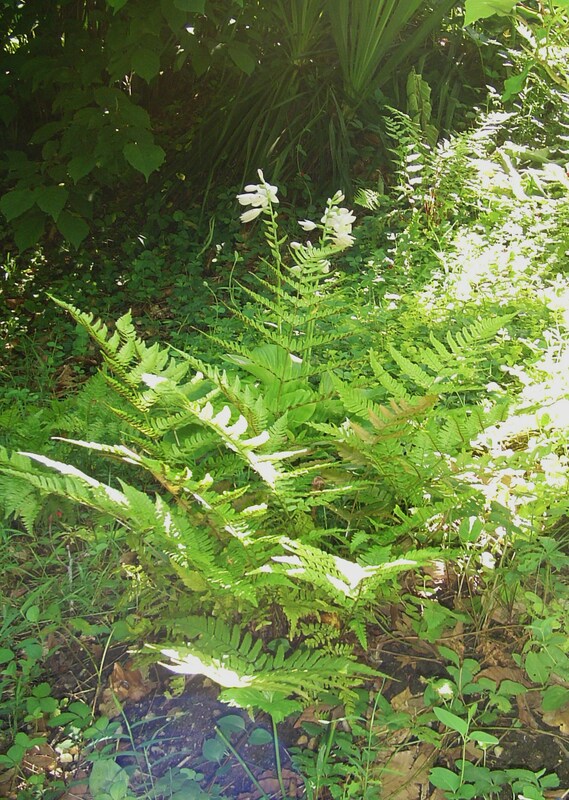 These ferns have delicate clumping fronds which grow to about 2’ in moist shade. Many of these have grey, silver, and burgundy coloration in the fronds. Many of these prefer a few hours of sun each day to develop the best color. This list is only a tiny fraction of the beautiful ferns hardy in zone 7b which will grow well in our forest gardens. I saw that you posted a like on my blog post about my Ostrich Ferns, gald you visited. You have a nice post here on all types of ferns, good information. Wish you had actually left me comments too!